Google Chrome&#39;s Second Edition Of Comic Book Pops Up ! Google Chrome's Second Edition Of Comic Book Pops Up ! The second comic how-to-view-the-pagerank-and-alexa-rank-in-google-chrome/">book of Google Chrome has popped up now. 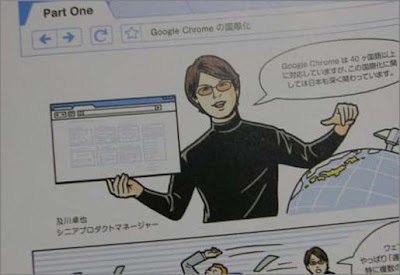 Already you have seen the first comic book of this kind was drawn by Scott McCloud to give an screenshot-of-google-chrome-for-mac/">introduction for the browser. The second edition in Japanese explains how it has been improved to render Non English characters and the motivation of pioneer-introduces-its-latest-navigation-gadget/">Navigational Suggest. Moreover, these yahoo-web-analytics-will-overcome-google/">features have been developed by the Japanese engineers. In other side, Google has begun to advertise the free-download-google-chrome-browser/">browser in short video clips.